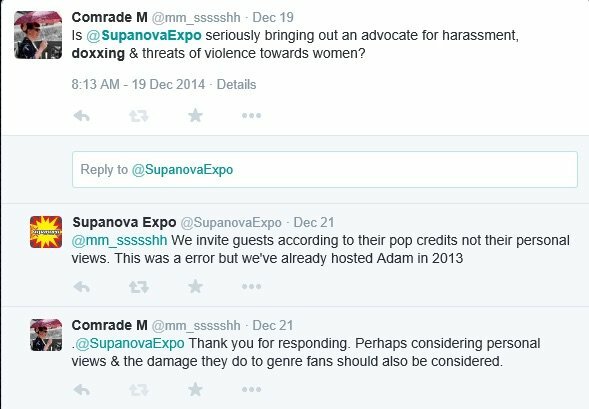 Back in December, Australian convention Supanova Pop Culture Expo stated over Twitter that, despite any rumors to the contrary, Firefly alum and Gamergate hashtag inventor Adam Baldwin wouldn’t be making an appearance at this year’s events. Unfortunately, the Expo’s stance was short-lived: according to their website, Baldwin will now be appearing at two events this June–and in light of the actor’s recent behavior, that’s alarming news to many fans. Over the past half-year, Baldwin has continually aligned himself with an online hate group targeting primarily women and people of color under the guise of guarding ethics in game journalism. You all know the group I’m talking about; heck, given the attention online harassment has garnered in mainstream media of late, even some people who barely go on the Internet know about Gamergate. 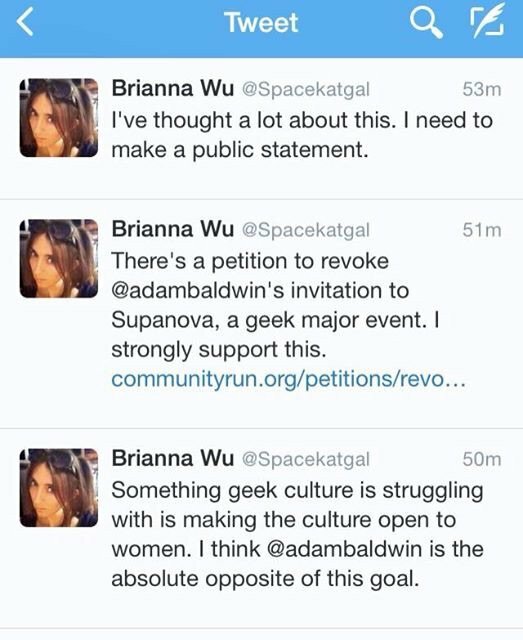 Considering the abuse women like Anita Sarkeesian have faced at the hands of some of the movement’s members, it would stand to reason that for someone like Baldwin, whose livelihood (and certainly his demand as a con guest) is fairly dependent on his relationship with fans, identifying as a Gamergater should be a career killer–and if women received the respect we deserve overall in nerd culture, it could be. Over the past six months, Adam Baldwin has been involved in numerous instances of harassment and abuse towards women […] In one specific instance, Baldwin directly linked to videos that disclosed the personal details (commonly known as “doxxing”) of game developers Zoe Quinn and Brianna Wu to his several thousand twitter followers. This further inflamed the hostile situations that Quinn and Wu had been (and continues to be) suffering. The videos in question were posted by Baldwin to his Twitter back in August. Although our coverage of the incident originally reported that a video linked directly to the doxxing of Zoe Quinn, we later edited the piece to reflect Baldwin’s clarification that the doxxing was in the comments of the video instead. One thing you have to understand about the Australian con scene is that it is tiny. Aside from a few niche events for Anime fans and cosplay enthusiasts, we have two major brands that travel the country: reedpop’s Oz Comic Con, and the family-operated Supanova Expos. So when you announce a guest, that may be the only chance you have to see them that year, maybe two, maybe ever. They basically set the atmosphere for the entire event. For example, John Barrowman (bless his heart) came out for the same event last year; every line was full of Whovians, Arrow fans, and fans of sass. So it’s not a long bow to draw to say that if they announce someone who has often been touted as the architect of Gamergate, to draw like-minded individuals. And how the presence of someone that may be triggering, plus those like-minded individuals, would create a toxic environment for many attendees. Some have argued that a person’s political views need to be separate to their professional duties, and I understand that train of thought. I’m not going after Kevin Sorbo or Dean Cain or Michael Rooker, for example, despite not agreeing with their views, because for the most part they keep it to themselves and are professionals about their work (emphasis “most part” – I know about Kevin Sorbo’s latest works). But Baldwin chose, and continues to choose to be active in his bigotry and hatred. It’s this proactive nature that sets off alarm bells, for me. 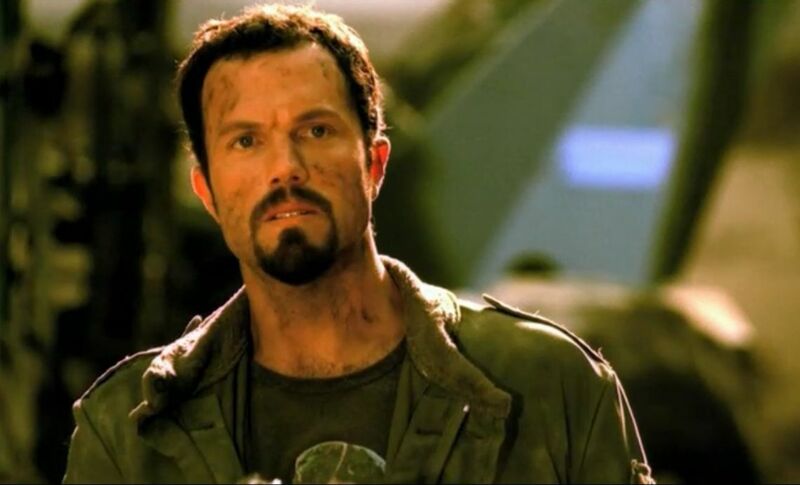 While we wish Adam Baldwin’s attendance in Supanova in Sydney and Perth this June wasn’t a controversial issue, it clearly is, and the reasons why are now understood. We ask for your patience and understanding while we deal with the developments. Regardless of what the ultimate outcome is please know that we 100% agree with your right, as our fans, to have your say, to share your feelings, to create or sign petitions in the positive or the negative, to protest or support. It’s your voice that’s made us who we are. We only ask that you don’t villify or attack one party or the other for holding differing views in the process. We’re one community of fans here, that have come together from various areas of pop culture, and Supanova is as much your space as it is ours. Supanova Founder and Event Director. Supanova has yet to return The Mary Sue’s requests for a statement. The fact of the matter is I’m not a gamer and had no idea about Gamergate. I was basking on a beach overseas during my annual holiday, August last year, when it all started. When I arrived back I got stuck into producing our November 2014 expos in addition to trying to lock down guests for 2015. Further, we hosted Adam in April 2013 at our Melbourne and Gold Coast events, and he was excellently received so for me it was business as usual; Adam being a star of Firefly/Serenity/Chuck plus so much more and we as Supanova wanting to give our fans in other cities an opportunity an opportunity to see him as well. So there’s no “despite” as I only found out about Gamergate once I announced Adam’s acceptance of our contract in early November, to my team in mid-December. Sexual harassment and a toxic dude-bro atmosphere are still too prevalent overall in con culture, but many events are working to consciously create an environment where attendees of all genders feel safer and more accepted than ever before. Especially in light of this new inclusivity, it seems counterintuitive for Supanova to decide to host a guest who is unconcerned at best about the women whose welfare he might have endangered by supporting Gamergate. Australian feminist group Destroy the Joint encourages anyone concerned over the message that Baldwin’s appearance at Supanova would send to the Expo’s attendees and the wider con community to sign Santos’ petition or write to Daniel Zachariou at daniel@supanova.com.au.